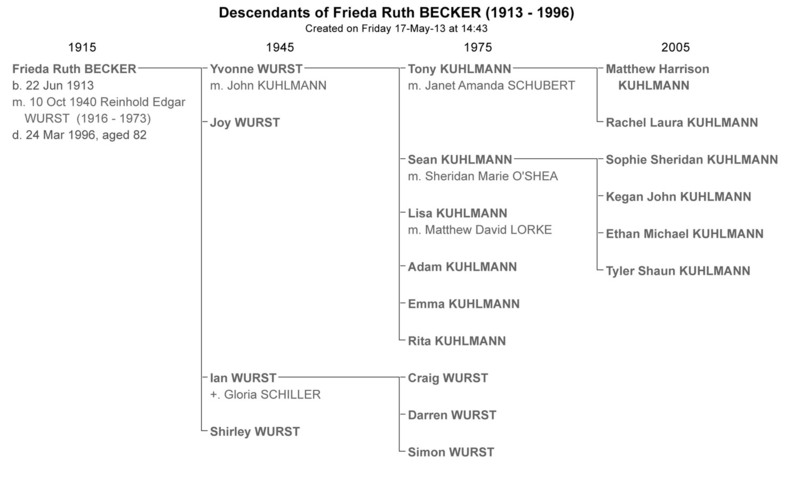 Frieda was born at Laura, South Australia, on 22 June 1913, the third child of the late Gotthilf Benjamin Richard and Emma Cecilia Becker, and the sister of Rita, Eric, Melvin, Linda, Lorna (deceased) and Rex. She was baptised on 3 August 1913 and confirmed on 13 November 1927 at Holy Trinity Lutheran Church, Appila, by the late Pastor Adolf Ortenburger. It was in the same church that she married Reinhold Edgar Wurst on 10 October 1940. The marriage was blessed with four children: Yvonne, Joy, Ian and Shirley. Frieda was a member of the Holy Trinity Lutheran Church, Appila, until April 1958 when the family moved to a dairy farm at Virginia and joined the Lutheran Church at Salisbury, SA. In October 1960 the family moved to South Plympton, SA, and took up membership at Faith Lutheran Church, Warradale, and in 1968 joined St Stephens Lutheran Church, Adelaide. Frieda remained a faithful member at St Stephens until her death. After the death of her husband on 23 March 1973, Frieda made her home at Lockleys with her daughter, Joy. In 1992 she moved back to the original home at South Plympton and lived with her son and daughter-in-law, Ian and Gloria and family. After a fall resulting in a broken hip in late December 1994, she went to live with her older daughter and son-in-law, Yvonne and John Kuhlmann, and their family at Penfield, SA. Here she was under the spiritual care of Pastor Peter Traeger of Elizabeth. Frieda was a home maker, a loving wife and mother. She loved to knit, crochet, sew and read. She loved animals – her dog, cats and canaries. But most of all she loved her garden and wherever she lived she had a thriving and colourful garden. She was a generous and supportive person, with a wonderful sense of humour and a loving smile. In the latter years particularly, arthritis robbed her of the enjoyment of many of her interests. On 23 March 1996 Frieda had a fall which resulted in a fractured pelvis and serious complications. She passed away early Sunday morning on 24 March 1996, at the Queen Elizabeth Hospital, Adelaide. She is sadly missed by her children: Yvonne and John, Joy, Ian and Gloria, Shirley; her grandchildren, Tony and Janet, Sean, Lisa, Adam, Emma, Rita, Craig, Darren, and Simon. She is also survived by two brothers, four sisters-in-law, and her Aunt Hilda who was her godmother. Her family and friends mourn her passing but are thankful that she is at peace with her Lord and Saviour, Jesus Christ.